I especially enjoy the Ud played by Richard Hagopian. 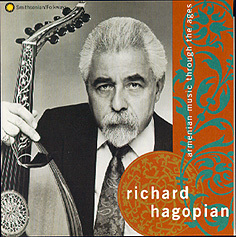 To hear this wonderful Armenian music visit Folkways:Richard Hagopian. Unfortunately, I have not seen him perform a Kef live. He only comes to my area once or twice a year. The last two times I had car problems and he was playing an hour away. Maybe next time. Richard Hagopian was born of Armenian parents. At the age of ten, he began studying the `ud with Kanuni Garbis Bakirgian. Today, Mr. Hagopian is an `ud virtuoso. He performs at many folk festivals and Armenian events. He is the recipient of numerous grants and awards.